For other uses, see MSX (disambiguation). "MSX2" redirects here. For the protein, see Msh homeobox 2. MSX is a standardized home computer architecture, announced by Microsoft on June 16, 1983. It was conceived and marketed by Kazuhiko Nishi, then vice-president at Microsoft Japan and director at ASCII Corporation. Nishi conceived the project as an attempt to create unified standards among various home computing system manufacturers of the period. MSX systems were popular in Japan and several other countries. It is difficult to determine how many MSX computers were sold worldwide, but eventually 5 million MSX-based units were sold in Japan alone. Despite Microsoft's involvement, few MSX-based machines were released in the United States. Before the great success of Nintendo's Family Computer, MSX was the platform for which major Japanese game studios such as Konami and Hudson Soft produced video games. The Metal Gear series, for example, was first written for MSX hardware. 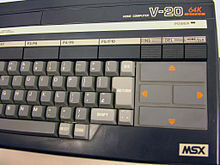 The Spectravideo SV-328 was the predecessor of the MSX standard. Many MSX programs were unofficially ported to the SV-328 by home programmers. In the early 1980s, most home computers manufactured in Japan such as the NEC PC-6001 and PC-8000 series, Fujitsu's FM-7 and FM-8, and Hitachi's Basic Master featured a variant of the Microsoft BASIC interpreter integrated into their on-board ROMs. The hardware design of these computers and the various dialects of their BASICs were incompatible. Other Japanese consumer electronics firms such as Panasonic, Canon, Casio, Yamaha, Pioneer, and Sanyo were searching for ways to enter the new home computer market. Nishi's standard was built around the Spectravideo SV-328 computer. 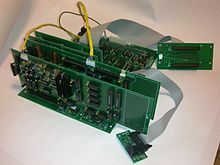 The standard consisted primarily of several off-the-shelf parts; the main CPU was a 3.58 MHz Zilog Z80, the Texas Instruments TMS9918 graphics chip with 16 KB of dedicated VRAM, the sound and partial I/O support was provided by the AY-3-8910 chip manufactured by General Instrument (GI), and an Intel 8255 Programmable Peripheral Interface chip was used for the parallel I/O such as the keyboard. This was a choice of components that was shared by many other home computers and games consoles of the period, such as the ColecoVision home computer (an emulator was later available with which MSX systems could run some of its software), and the Sega SG-1000 video game system. To reduce overall system cost, many MSX models used a custom IC known as "MSX-Engine", which integrated glue logic, 8255 PPI, YM2149 compatible soundchip and more, sometimes even the Z80 CPU. However, almost all MSX systems used a professional keyboard instead of a chiclet keyboard, driving the price up compared to the original SV-328. Consequently, these components alongside Microsoft's MSX BASIC made the MSX a competitive, though somewhat expensive, home computer package. Yamaha YIS503II MSX Personal Computer designed for Soviet schools—the abbreviature "КУВТ" means "Class of Teaching Computing Equipment)"
The Canon V-20 has 64 KB of RAM while its little brother, the V-10, has 16 KB. On 27 June 1983, the MSX was formally announced during a press conference, and a slew of big Japanese firms declared their plans to introduce machines. The Japanese companies avoided the intensely competitive U.S. home computer market, which was in the throes of a Commodore-led price war. Only Spectravideo and Yamaha briefly marketed MSX machines in the U.S. Spectravideo's MSX enjoyed very little success, and Yamaha's CX5M model, built to interface with various types of MIDI equipment, was billed more as a digital music tool than a standard personal computer. During the 1980s, Europe became the largest computer games market (as opposed to console games) in the world, and the extremely popular Commodore 64, Atari 8-bit, and Sinclair ZX Spectrum computers dominated. By the time the MSX was launched in Europe, several more popular 8-bit home computers had also arrived, and it was far too late to capture the extremely crowded European 8-bit computer market. A problem for some game software developers was that the method by which MSX-1 computers addressed their video RAM could be quite slow compared to systems that gave direct access to the video memory. This, and the fact that the completely different features the MSX-1's video chip (using the MSX Video access method) had to compensate for the slower video access were not efficiently used while porting (mostly Spectrum) software, made the MSX-1 appear slower when running ported games. Some minor compatibility issues also plagued ported Spectrum games. For example, the Toshiba HX-10 machine was unable to read certain key combinations at the same time, preventing the Spectrum "standard" of "Q, A, O, P steering", whereas machines by other manufacturers worked fine. Later (ported) games tended to use the MSX-1 joystick port or used MSX's official arrow keys and space bar, or offered the option to choose other keys with which to control the program, solving the problem. A larger problem was that the designers of the MSX standard bank switching protocol did not prescribe to hardware manufacturers in which banks the cartridges and, more importantly, the RAM should be found. Moreover, the MSX's BIOS did not provide this information either, thus requiring programmers to implement complex routines to "find" these resources. Often programmers assumed that the RAM and cartridges would be available at a "default" bank switch location; in reality some systems had their RAM or cartridge slot(s) not at the "default" location, but at another bank switch location (i.e. Toshiba HX-20). In those cases programs failed to run because they only "saw" 32 KB of the available memory, instead of the full 64 KB that almost all MSX-1 machines offered. All other mainstream MSX-1 machines offered at least the full 64 KB of RAM, with a very few exceptions, such as some early Phillips MSX-1 models (the VG8000 offered 16 KB of RAM and the VG8010, 32 KB) or the Casio PV-7, a low budget MSX targeted for playing games, which has only 8 KB. MSX spawned four generations: MSX (1983), MSX2 (1985), MSX2+ (1988), and MSX TurboR (1990). The first three were 8-bit computers based on the Z80 microprocessor, while the MSX TurboR was based on a custom 16-bit R800 microprocessor developed by ASCII Corporation. By the time the MSX TurboR standard was announced in 1990, only Panasonic was manufacturing MSX computers. Its initial model FS-A1ST met with moderate success, but the upgraded model FS-A1GT introduced in 1991 sold poorly due to its high retail cost of 99800 yen. Production of the TurboR ended in 1993 when Panasonic decided to focus on the release of 3DO. 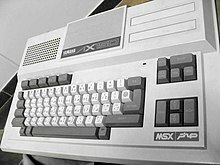 The MSX3 was scheduled for market in 1990. Delays in the development of its VDP—then named V9978 on the pre-release spec sheets—caused Yamaha to miss its time to market deadline. In its place, an improved MSX2+ was released as the MSX TurboR; features of the new R800 processor such as DMA and 24-bit addressing were disabled. The VDP was eventually delivered two years after its planned deadline, by which time the market had moved on. In an attempt to reduce its financial loss, Yamaha stripped nearly all V9958 compatibility and marketed the resulting V9990 E-VDP III as a video-chipset for PC VGA graphic cards, with moderate success. Sony also employed the V7040 RGB encoder chip on many other products. MSX-FAN Magazine also mentions the impressive power of the V9990, being able to compete with much more expensive hardware such as Sharp's X68000. In Japan, South Korea, Argentina, and Brazil, MSX was the paramount home computer system of the 1980s. It was also quite popular in continental Europe, especially in the Netherlands and Spain. Classrooms full of networked Yamaha MSX were used for teaching informatics in schools in some Arab countries, the Soviet Union, and Cuba, where they were wildly popular in all government education schools and centers. However, because MSX never took off in the U.S., Canada, Mexico, Sweden, Norway, Denmark, Greece, the Czech Republic, Hungary, Poland, Serbia, Bulgaria, Romania, India, Portugal and New Zealand, it never became the worldwide standard that its makers had envisioned. Before MSX's lack of success in these markets became apparent, US manufacturer Commodore Business Machines overhauled its product line in the early 1980s and introduced models such as the Plus/4 and Commodore 16 that were intended to better compete with the features of MSX computers. In the 1980s, Sakhr (صخر) Computers (Developed by Al Alamiah, a Kuwaiti company), started the production of the first Arabic version of MSX computers. They started producing a Yamaha AX100 and a few other models, including MSX2 and MSX2+. The most popular and affordable model within Arab States of the Persian Gulf was the Sakhr MSX AX170. They were also the first to Arabise BASIC and the MSX LOGO. Al-Alamiah produced other common models, including AX100, AX123, AX150, AX170, AH200, AX200, AX230, AX235, AX250, AX330, AX350-I, AX350-II, AX355, AX370, AX500, AX550, AX660, and AX990. The only MSX console with a Famicom game slot in the MSX computer is AX330. The user can switch between MSX and Famicom modes by pressing a button on the back of the computer. The other variants, which are compatible with the Sega Mega Drive, are the AX660 and AX990. Sega Master System PAL cartridges are playable with AX660, and AX990 if both the TV Game Computer Cartridge Converter and Master System Converter are attached at the same time, connecting the Sega Master System cartridge to the game inlet in the computer. Attaching only the Master System Converter to play Sega Master Cartridges on the AX660, or AX990 is not possible because of the inlet depth and the physical shape of the Master System Converter that prevent the converter from being attached correctly to the AX660 and AX990 computers. Many MSX computers were used during the 1980s in the former Eastern Bloc countries as a tool for subtitling pirated films on VHS, or Betamax cassettes. The MSX computers were used for their simplicity and ability to display prepared titles in real time as superimposed text on mastering tapes. The MSX arrived in Argentina in late 1984. The most popular model was the Talent MSX DPC-200, based on the Daewoo MSX DPC-200. Other models were the Spectravideo (SVI) 728 and the SVI X´Press, with a 3.5" built-in drive. Later on came the Toshiba and smaller numbers of Gradiente models from Brazil. In late 1987, Talent presented the MSX2 TPC-310 ´Turbo´ in the Argentine market. ´Turbo´ was just a name, not referring to MSX2+, also based on Daewoo design. The MSX was as highly successful a computer in Argentina as was the Commodore 64, thanks to its use in education at the national level. The MSX-Logo language was widely used in schools. MSXII+ never made it to the market in Argentina and MSX production ceased in 1990. 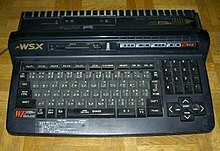 In total, 9 million MSX computers were sold in Japan, making it relatively popular but still not the global standard it was intended to be. In comparison with rival 8-bit computers, the Commodore 64 sold 17 million units worldwide in its lifetime, the Apple II sold 6 million units, the ZX Spectrum over 5 million units, the Atari 8-bit sold at least 4 million units, the Amstrad CPC sold 3 million units, and the Tandy TRS-80 Model 1 sold 250,000 units. A Sony MSX2 machine was launched into space on board of a Russian MIR spacecraft. One professional broadcast video workstation was based on Sony HitBit HB-F900 MSX2 computer. The system MSX most closely resembled was the Spectravideo SV-328 home computer (Spectravideo even claimed to be "MSX compatible" in advertisements before the actual launch of MSX systems, but it was in fact not completely compatible with it). This led to a new and short-lived kind of software cracking: converting. Since the MSX games were unplayable on the SV-328 computer, SV-328 crackers developed a method of modifying the (MSX) games to make them work on the SV-328. In most cases this included downloading the MSX BIOS to the SV-328 from tape or floppy disk. Spectravideo later launched the SVI-728 which completely adhered to the MSX standard. The Sega SG-1000, the Memotech MTX and the ColecoVision all have many similarities with the MSX1 standard, but none are really compatible with it. Porting games between those systems is somewhat easy. It was also very common to port games from the ZX Spectrum to the MSX, since both have the same CPU, the Spectrum 128 had the same soundchip, and the ZX Spectrum's graphic mode could be easily emulated on the MSX's screen-2 mode. By default MSX machines have a hardcoded character set and keyboard scan code handling algorithm. While MSX has full application software compatibility at the firmware (BIOS) level, due to minor hardware differences, replacement of the BIOS with another from different PC may render incorrect scan code translations and thus incorrect behaviour of the keyboard subsystem for the application software. In 2011 AGE Labs introduced Language Pack firmware, aiming to make each model support several localizations. By default installed into GR8BIT instead of the Kanji-ROM, it allows changing the character set and keyboard layout of the machine at startup. This allowed changing between Japanese, Russian, International and Portuguese locales, and the ability to change locales during machine operation using newly introduced BASIC command LANG. Selected locale setting is stored into the unused RTC NVRAM memory space. In 2001, Kazuhiko Nishi initiated a 'MSX Revival' around an official MSX emulator called MSXPLAYer. This is the only official MSX emulator as all MSX copyrights are maintained by the MSX Association. In 2004, a Dutch company Bazix announced they had become the representatives of MSX Association in Europe, being the English contact for any questions regarding the MSX trademarks, copyrights, and licensing. On October 17, 2006, Bazix launched WOOMB.Net, a website selling MSX games in English and other languages, with a selection of 14 games. In Japan, game sales began earlier, through Project EGG. WOOMB.Net was the English counterpart of this and other Japanese services offered by D4 Enterprise, which also announced in August 2006 the launch of a new MSX2 compatible system called the "one chip-MSX", a system based on an Altera Cyclone EP1C12Q240C8 FPGA. 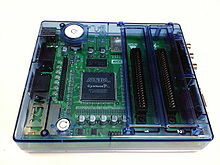 The one chip-MSX" is similar in concept to the C-One, a Commodore 64 clone also built on the basis of a single FPGA chip. The new MSX system is housed in a box made out of transparent blue plastic, and can be used with a standard monitor (or TV) and a PC keyboard. It has two MSX cartridge slots and supports the audio extensions MSX-MUSIC and SCC+. A SD/MMC-flashcard can be used as an external storage medium, emulating a disk drive and can be used to boot MSX-DOS. Due to its VHDL programmable hardware, it is possible to give the device new hardware extensions simply by running a reconfiguration program under MSX-DOS. The "one chip-MSX" also has two USB connectors that can be used after adding some supporting VHDL code. On June 7, 2008, the MSX Resource Center Foundation reported that the MSX trademark had moved from MSX Association to the MSX Licensing Corporation, referring to a Benelux trademark register page of MSX, which names the MSX Licensing Corporation as entitled entity till 28-10-2013. At that time, the website of the MSX Licensing Corporation that they linked to as source, had a text saying 'We are planning to revitalize MSX, the innovative computer platform.' on it. However, the website was later changed to contain only the logo of ITNY & Partners, and a link to ITNY & Partners' English and Japanese websites and has no mention of the MSX Licensing Corporation at all. On June 26, 2008, Bazix reported on their website's front page that they are no longer the representative of MSX Association, due to being unable to achieve their goals of "bringing about the commercial MSX Revival beyond the Japanese borders" and "the transfer of the MSX trademark from MSX Association to MSX Licensing Corporation" and "no outlook on any progress in the Western One Chip MSX project any time soon". As a result of this, WOOMB.Net is taken offline as well, with its website redirecting to the Bazix website, until "a solution free of MSX Association's contributions has been completed". According to their post, they will cooperate with D4 Enterprise and the MSX Licensing Corporation "in one or more retro gaming related projects". On July 4, 2008, MSX Association's European contact website, which states to be the "only official contact place for MSX Association in Europe", reports that the MSX trademark and copyright has been under the MSX Licensing Corporation holding ever since 1983. It explains that MSX Association, chaired by Dr. Kazuhiko Nishi is the operational division of MSX Licensing Corporation which manages the trademarks, logo and copyrights for MSX. According to the same article, D4 Enterprise "refuse to pay royalties to MSX Association for the use of ESE Artists' Factory's work in 1chipMSX and the software licenses in Project Egg", thus they deal with Kazuhiko Nishi 'directly' through the MSX Licensing Corporation. The article mentions as well the ESE MSX System 3, on which the 1chipMSX (also known as One Chip MSX or OCM) is based. On July 5, 2008, the MSX Association's Europe website posted an announcement reporting that D4 Enterprise was selling the 1chipMSX illegally. In the same post it is stated that Bazix no longer is their representative in Europe, due to Bazix cutting off their relationship. In 2011, AGE Labs announced the launch of a MSX kit called GR8BIT - the do-it-yourself computer for learning purposes, which was licensed by the MSX Licensing Corporation. The kit is priced at $499 and includes all necessary components to assemble a working MSX2 compatible computer, except for an ATX chassis, power supply, floppy drive, hard disk, PS/2 keyboard and monitor. It also comes with assembly and operational manuals and a supplement compiled from vendor and community support (from the "GR8BIT Engineering Community"). Some of the Korean forum members who made Zemmix Neo created a new version of MSX called Mini IQ3000 Cutie, which has similar features to the IQ-2000 (MSX2. Made in Korea. Daewoo Electronics ) It is based on 1ChipMSX but has some special features like 'Scan Line Generator' and 'Multi Language Support'. The scan line generator generates scan lines to show the MSX screen with better quality. It supports 2 languages at the same time. Normally it shows Korean font and working as Korean version of MSX but when pressing the 'del' key while booting, it changes to Japanese mode. Even though the default mode is Korean, the default font allocation table is Japanese, as it shows Japanese characters when executing Japanese version software. Spectravideo, Philips, Al Alamiah, Sony, Sanyo, Mitsubishi, Toshiba, Hitachi, National, Panasonic, Canon, Casio, Pioneer, Fujitsu General, Yamaha, JVC, Yashica- Kyocera, GoldStar, Samsung/Fenner, Daewoo/Yeno, Gradiente, Sharp/Epcom, Talent. Philips, Sony, Sanyo, Mitsubishi, Victor (a.k.a. JVC), Toshiba, National, Panasonic, Canon, Yamaha, ACVS/CIEL*, DDX*, Daewoo/Yeno, NTT, Talent. Sony, Sanyo, Panasonic, ACVS/CIEL*, DDX*. Note *: Clones or Unlicensed equipment. Resolution: 256×192 (16 colours). In reality, there are just 15 colour tints available, because, just like Sinclair Spectrum there are two codes for black. Unlike the Spectrum, however, one of the blacks is actually "transparent", so the MSX video picture could be overlaid on another video signal, for example one from a video disk. The minimal video RAM is now 128 kB. Up to 192 kB is supported. Keyboard is a functionally separate unit which could be connected by non-multiplexed and multiplexed interfaces. Multiplexed keyboard units feature additional data direction line, allowing sending scan line number to the keyboard using same data lines used for return scan code, decreasing overall number of wires between keyboard and machine. Non-multiplexed interface is usually used for internal keyboards (and some external keyboards, like Panasonic CF-3300); multiplexed interface is used for external keyboards (e.g. in Yamaha YIS805 model). Keyboard is organized as a matrix with maximum 11 input lines and 8 output lines, accounting for maximum 88 keys (including all control, numerical and alphanumerical keys). Each scan line is regularly queried to identify the state of the keys on the line; query speed is identified by the system interrupt frequency. Such organization allows system to sense state of each key, not exhibiting notorious problem with 8042 microcontroller-based keyboards when pressing several keys simultaneously (usually more than 3) generates wrong input characters, or renders inability to sense the press of more keys. Due to the keyboard scan being controlled by the system interrupts, one of the troubleshooting hints when an MSX machine does not display any image (assuming power is present) is to press the CAPS key to see if the respective LED toggles. If it does not toggle, the system is likely suffering a more serious problem than just lack of image on the screen (i.e. the problem with video cable or video display interface in overall). In 2009 Kamil Karimov designed the adapter board to connect PS/2 keyboard to the multiplexed MSX keyboard interface. The firmware embedded into its ATTiny chip was tailored for Daewoo CPC machines. In 2011 AGE Labs embedded a PS/2 keyboard controller unit, based on Microchip microcontroller, into its GR8BIT do-it-yourself machine. Its firmware is developed to directly convert PS/2 scan codes to the MSX keyboard scan codes. Thus it is fully transparent to the applications, allowing use of the controller unit with different MSX-compatible machines and for different localization setups. MSX standard requires at least 1 cartridge slot, most MSX models have 2. These slots are interchangeable, so in most cases it makes no difference in which slot a cartridge is inserted. The physical connector is a 50 pin (2 x 25 contacts), standard 2.54 mm (0.1 inch) pitch edge connector. Using these cartridge slots, a wide variety of peripherals could be connected. Regular game cartridges are about the size of an audio cassette (so-called "Konami size"). Despite their higher cost, this was a popular format due to its reliability and ease of use. Around 1985, Hudson Soft released the credit card-sized Bee Card, which was meant as a cheaper and more convenient alternative to ROM cartridges. But it was a commercial failure, and very few titles were released on the format. Source files for development of the MSX cartridges are available from AGE Labs for EAGLE. MSX systems generally did not have a built-in disk drive, so games were published mainly on cartridge and cassette tape. Sony created a battery backed RAM cartridge the HBI-55 "data cartridge" for some computers in their "Hit-Bit" line of MSX systems, that could be used to store programs or data as an alternative to cassette tapes. Floppy disk drives were available for MSX however, in the form of a cartridge containing the disk interface electronics and a BIOS extension ROM (the floppy disk drive interface), connected to an external case with the drive. In South-America, many of these systems used a 5.25 in (133 mm) floppy disk drive, but in Europe, 3.5 in (89 mm) drives were more popular. In Japan, some MSX1 systems included a built-in 3.5" disk drive, like the Panasonic (previously named Matsushita) CF-3000. In Europe, a range of Philips MSX2 systems NMS 8230, 8235, 8245, 8250 and above featured either 360 or 720 Kb 3.5" floppy drives. In 1985, the MSX2 was released, and these systems often (but not always) included a built-in 3.5" disk drive too. Consequently the popular media for games and other software shifted to floppy disks. The MSX-DOS disk operating system had internal software mechanisms much like CP/M (so CP/M software could be ported reasonably easily), but had a file system compatible with MS-DOS. Its user commands were also similar to early MS-DOS versions. In this way, Microsoft could promote MSX for home use while promoting MS-DOS based personal computers in office environments. The MSX 3.5" floppy disks are directly compatible with MS-DOS (although some details like file undeletion and boot sector code were different). Like MS-DOS 1, MSX disks (formatted) under MSX-DOS 1 have no support for subdirectories. In September 2012, AGE Labs extended the standard by including support for 1.44Mb 3.5” format. The 1.44Mb diskette size goes in two configurations: Standard (1 sector per cluster, 9 FAT sectors), and Compatible (4 sectors per cluster, 3 FAT sectors). 9 channels FM or 6 channels FM + 5 drums. YM3526 compatible. MSX computers are emulated on many platforms today. Early MSX emulators were often based on the code of the pioneer fMSX, a portable MSX emulator by Marat Fayzullin. Many emulators removed Fayzullin's Z80 emulation code entirely in later versions to avoid legal problems, as at the time fMSX wasn't free software. Somewhat later fMSX source code became free to use for non-profit use; however a license was still required for commercial use. On December 31, 2013, the Windows version of fMSX 3.7 was released, free for anyone to use. The official MSX emulator MSXPLAYer (in Japanese) is produced by the MSX Association, of which the inventor of the MSX standard, Kazuhiko Nishi, is the president. As of version 0.146.u, MESS currently supports 90 percent of all MSX Versions. In February 2007, Nintendo of Japan announced that MSX games will be available for the Wii's Virtual Console emulator. It was confirmed that the games would cost 700 Wii Points and will become available from the middle of 2007. It also became available for the Wii U on December 25, 2013. Ultimately 13 games, mainly Konami titles, for the Wii plus 1 for the Wii U were released for the service in Japan only. ^ Laing, Gordon (2004). Digital Retro: The Evolution and Design of the Personal Computer. Ilex Press. ^ "MSX: The Japanese are coming! The Japanese are coming!". The Register. June 27, 2013. ^ Kazuhiko Nishi - eNotes.com Reference. ^ Faceoff: will MSX be a success in the United States. ^ "Kojima Productions". Konami.jp. Retrieved 2011-06-22. ^ Mr. Kazuhiko Nishi (21 April 2001). MSX Fair Tilburg 2001 - by Totally Chaos (video). Event occurs at 14:40. Retrieved 2019-02-01. ^ Inc, InfoWorld Media Group (4 February 1985). "InfoWorld". InfoWorld Media Group, Inc. – via Google Books. ^ a b "Dvorak, John C. (2006-11-28). Whatever Happened to MSX Computers?. Dvorak Uncensored, 28 November 2006". Dvorak.org. 2006-11-28. Retrieved 2011-06-22. ^ Dvorak, John C. (7–14 January 1985). "MSX: The pong of the 1980s". InfoWorld. InfoWorld Media Group (Vol. 7, Num. 1–2): 88. ISSN 0199-6649. ^ "The Toshiba MSX (HX-10) 64K". retrovideogamesystems.com. ^ "VDP programming tutorial". map.grauw.nl. ^ "Distance education in the Cuban context". 22 July 2012. Archived from the original on 22 July 2012. ^ "Joven Club de Computación y Electrónica - EcuRed". www.ecured.cu. ^ "Cuba Bans PC Sales to Public". Wired. 2002-03-25. ^ "Mac Daily News 5 to 6 million Apple IIs sold". Macdailynews.com. Retrieved 2011-06-22. ^ "MSX IN SPAAAACCCEE". msx.gnu-linux.net. ^ a b Brychkov, Eugeny (2012). KB0004: Using GR8BIT Language Pack and PS2 Keyboard (PDF). AGE Labs. ^ MSX Resource Center. "One Chip MSX MKII". Msx.org. Retrieved 2011-06-22. ^ MSX Resource Center. "MSX Resource Center Foundation about MSX trademark". Msx.org. Retrieved 2011-06-22. ^ "Benelux trademark registration for the MSX trademark" (in Dutch). Register.boip.int. Retrieved 2011-06-22. ^ "The birth of a GR8BIT - The do it yourself MSX 2". MSX Resource Center. 2012-01-18. Retrieved 13 April 2013. ^ "GR8BIT Platform: The Real Engineering Experience". AGE Labs. Retrieved 13 April 2013. ^ Center, MSX Resource. "Mini IQ3000 (Temporarily name for small project) - MSX Resource Center (페이지 1/9)". www.msx.org. ^ "Portar MSX Tech Doc". problemkaputt.de. ^ Karimov, Kamil (2010-02-14). "Контроллер PS/2 клавиатуры для MSX (Russian)". MSX Resource Center. Retrieved 2013-09-20. ^ "2 standard MSX cartridge slots". Archived from the original on 2012-04-26. ^ "MSX breadboard schematic, board and library". AGE Labs. Archived from the original on 21 September 2013. Retrieved 23 June 2013. ^ "MSX-DOS 2 section". The Ultimate MSX FAQ. Faq.msxnet.org. Retrieved 2011-06-22. ^ "Storage subsystem v.3.0 Manual" (PDF). AGE Labs. Retrieved 23 June 2013. ^ "fMSX: Portable MSX Emulator". Fms.komkon.org. 2013-12-31. Retrieved 2014-03-31. MsxToday - Community dedicated to MSX standard computers. MSX.bas - Website dedicated to preserve and make available software written in MSX Basic. This page is based on the Wikipedia article MSX; it is used under the Creative Commons Attribution-ShareAlike 3.0 Unported License (CC-BY-SA). You may redistribute it, verbatim or modified, providing that you comply with the terms of the CC-BY-SA.